With 60 artists displaying their artworks in both towns, finding a particular artist may be difficult. 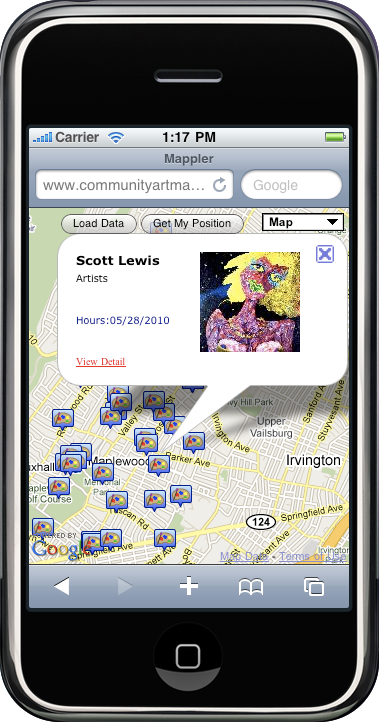 This map displays all the artists and their locations with extra features such as photos of the artists’ works and links to their personal websites. Additionally, this map is also accessible by using your iPhone or Android cell phones! Welcome to Community Art Map! *Above is an interactive map of Lambertville, NJ that displays various art galleries throughout the town. Looking for art? Looking to share your art? This website is a place for artists, organizations, art aficionados, and all others who enjoy art to locate galleries/museums and pinpoint their own works of art. Using interactive maps, users are able to easily find and access various types of information about their favorite museum or inform the public on their own exhibitions. Organizations can use this site to share their artwork and events. This technology also allows these businesses to easily update their information to share with the public. Organizations can easily share event information such as the type, location, time, and photos all visualized on one map. Take a look around to see the benefits of sharing your art to the community! You can also access our Interactive Maps through iPhone! Just type in either of the URLs listed below to view points, photos, videos, and trails from anywhere!